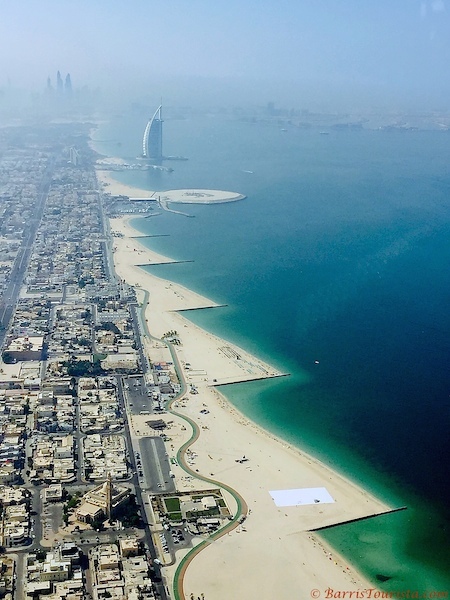 The United Arab Emirates—and especially Dubai—is an area that begs to be viewed on a grand scale. 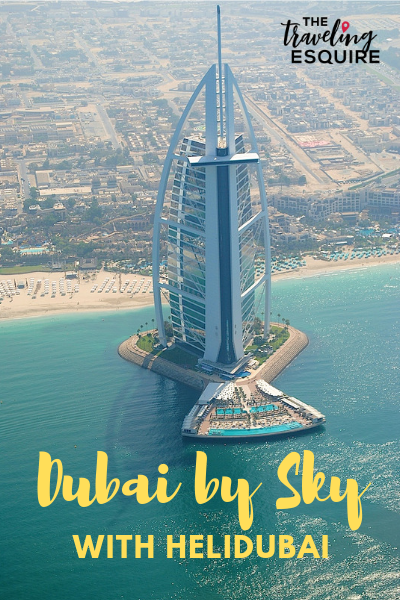 The Dubai skyline especially is picturesque, and what better way to see and experience it than from above. That’s why, on my recent trip to Dubai, I opted to take a helicopter ride with HeliDubai over the city to take in the views. 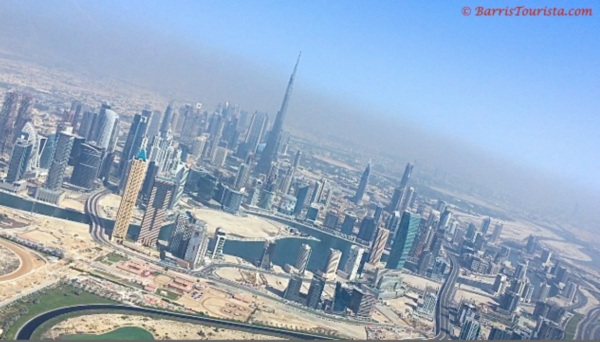 My ride with HeliDubai, who gave me a complimentary media ride, was definitely one of the highlights of my trip. To get to HeliDubai, you have to tell your cab driver to take to you the Sky Dubai skydiving office. As soon as you arrive, you check in with the desk staff and they promptly weigh you on a scale in the office. Because…you know…aerodynamics. But don’t worry, they don’t announce your weight to the masses. The next step is the safety video. They take you and the others you will be riding with to a special area to watch a safety video on helicopter safety. When it is time for your ride, you are equipped with life jackets and you put all of your belongings, other than a cellular phone and your camera, in a locked locker. Based on the weight of everyone in the copter, they arrange your seating arrangements on the helicopter, with one person in the front and up to four people in the back. Then, you soar. I have only ridden in a helicopter once before, so my nerves aren’t so great with regards to riding them…or any little or propeller plane for that matter. It’s not my ministry. So as the time was approaching for the ride, I have to say I was a little nervous. And I definitely took my motion sickness medication just in case. We boarded in seating order and I was the lucky one. I got the coveted front seat, which was great because I am hippy and I was super excited about the clear views so I could take some dope pictures. My nerves quickly went away, as the ride was remarkably smooth. We quickly elevated and started taking in the views. 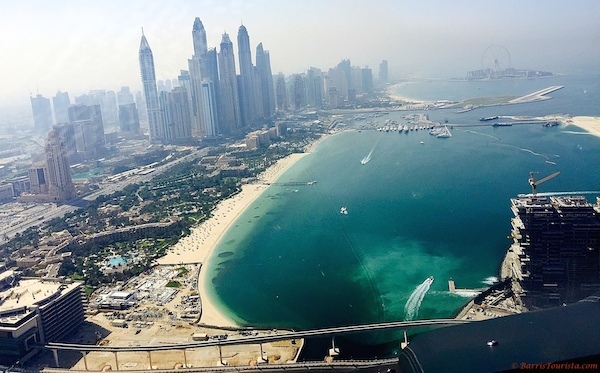 Because HeliDubai is right on the water, you get some amazing skyline views. We could see the whole skyline and city of Dubai, with its high rises and landmark buildings. As soon as you take off, you can see portions of the Palm. 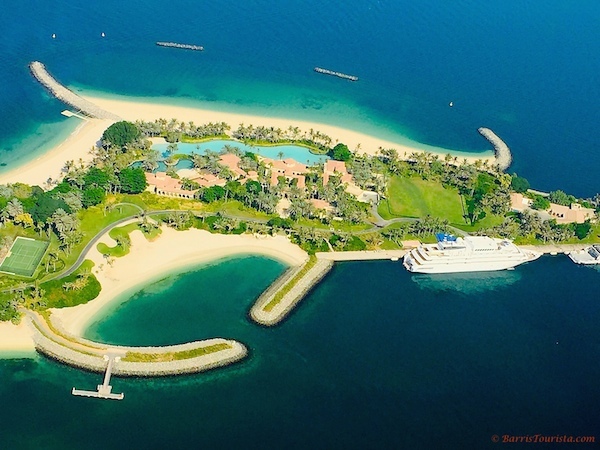 These are the artificial islands in the shape of a palm off the coastline. Though we didn’t get a straight-on view, it was super cool and we could see it as we were taking off and coming in for landing. 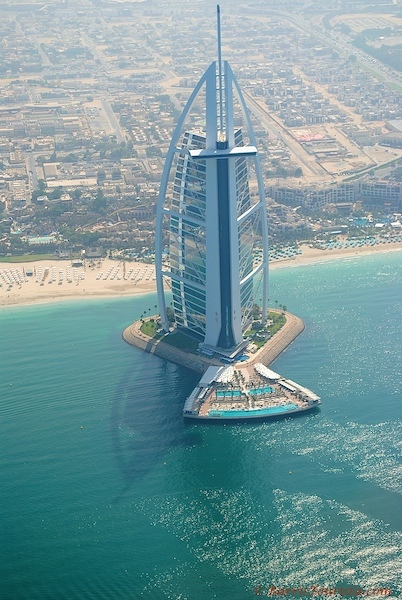 We then flew along the coast, and we were able to get some dope aerial shots of the only 7-star hotel in the world, the Burj Al Arab. Seeing the whole city, which isn’t huge I will add, from the sky offered viewpoints and perspective on just how big some of the tall buildings were. But it is important to note that you aren’t likely to get super clear, perfect views. Because…desert. Dust is in the air from the sand and also the construction that the city is undertaking at the moment. My 12-minute flight went so fast, I definitely wasn’t ready for it to end! Once you get back and land, the staff will take pictures with the city skyline and helicopter in the background. Not only will they take the photos for you to purchase, but they will also take a couple on your phone for you. You then collect your things and head back in to purchase photos and head back to your hotel. 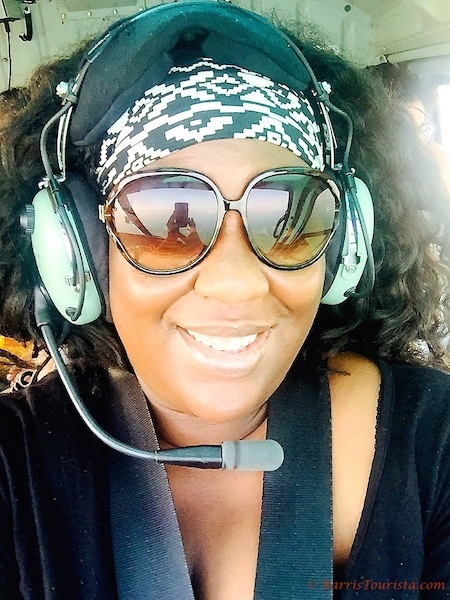 Overall, I enjoyed the HeliDubai flight. It was a lot of fun with great views and offered a unique perspective. Our group had some good fun and I got some dope photos on both my phone and my pro camera. What more could you ask for. I definitely recommend HeliDubai if you want to ball out in Dubai and get a fresh perspective on the city. They have flights of varying length so check out your options and enjoy! Thanks to HeliDubai for comping my flight! All opinions expressed are my own. What an incredible experience. I’d feel a little uneasy in such a compact aircraft too, but yolo! The overhead view is stunning! Wow that seema like an unreal experience , definitely ticked it off your bucket list, eh? ? I soooo should have done that while I was living in that region. The views look absolutely amazing and I love your pictures. Thanks so much! How long were you in the region? It was a blast! I so want to do this, the views looks incredible. Dubai is at the top of my places to go list. It was pretty darn cool, Mimi! You and the kiddos would really enjoy this! That is a unique way to see the beautiful Dubai. Thanks for sharing! Definitely you unique and a cool overhead view. It makes you realize how much of the area is still being built up! I must say pictures are goregous. I am not in the ministry for anything smaller than a CRJ or ERJ. So helicopters are out for me. But glad you enjoyed it. Thanks Monique! And yeah, my nerves were definitely bad initially. Then you get caught up in the view and forget to be nervous LOL. These photos are breathtaking. I am scared of helicopters but the moment I take a plane for the first time, I am pretty sure I will end up taking a helicopter soon after. 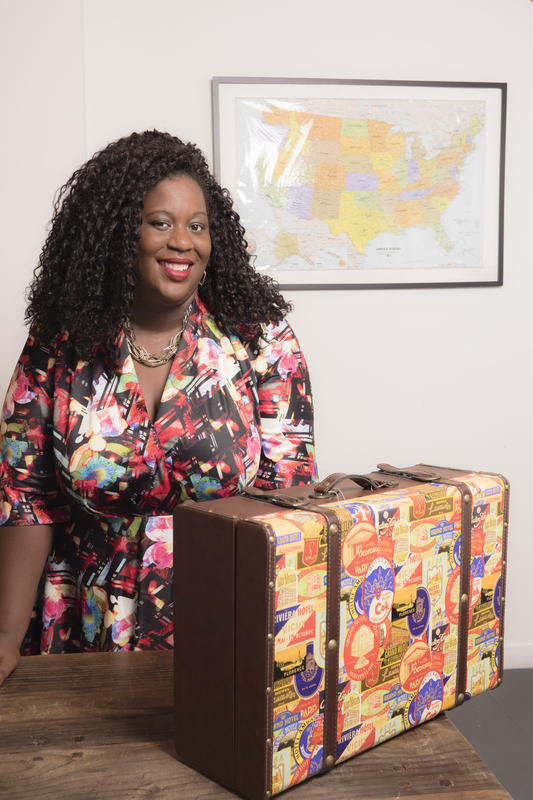 Ma’am, we’ve got to get you on that plane! I would be terrified. Such beautiful view of Dubai! You are so BRAVE. I couldn’t do this helicopter tour. My gut just won’t allow it. You’re so brave. I’ve never been in a helicopter. My husband has several times. I don’t think I could do it! But your photos are gorgeous. These views are so amazing, what a great opportunity! I’ll have to remember it for when I go to Dubai. This is simply amazing. The views from the top are to die for. Dubai is high on my list. I am hoping to visit some time this year that’s for sure. Did you sky dive also? I LOVE helicopter tours. I’ve been on two this year (before that I had never been on one) and I can’t get over how amazing they are. Yours looks like it was as well! What an amazing experience! Helis are definitely my fav way to explore a city 😀 Definitely on my list for when I go to Dubai. Tell them you saw this review! It was amazing! 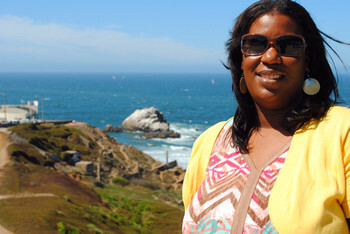 Awesome Tyra! I’ve yet to ride in a helicopter. The views of the city are amazing.